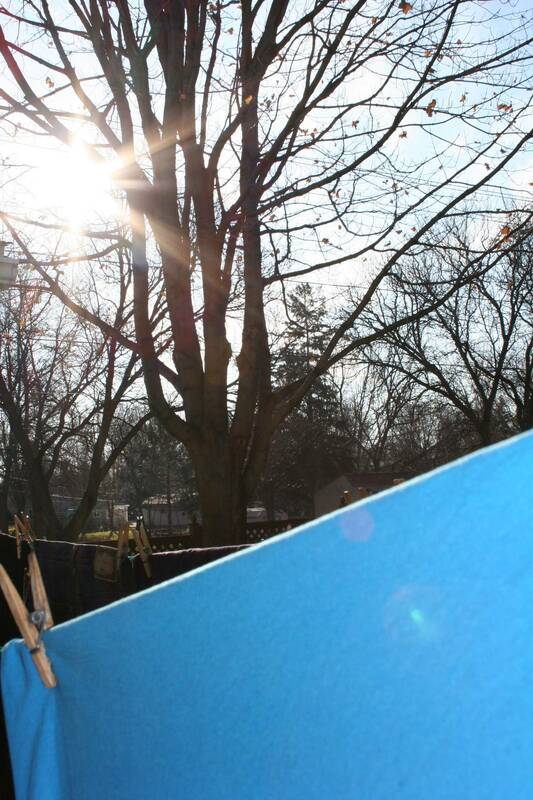 I'm pretty fanatical about hanging laundry outside to dry, even in freezing temperatures. There's something beautiful and defying about hanging a fruit-themed vintage tablecloth outside on a November morning in Minnesota. ALREADY, MY FINGERS are beginning to numb and I am only half way through the first basket of wet laundry. I reach into the clothes basket, to the very bottom, and pull out a pair of jeans. Then I slide my hand inside the clothespin bag, draw out two clothespins. Strategically, I clip the denim pants onto the line in a spot where the sun shines most intensely. Then I move on to the next pair of jeans, the heavy towels, the shirts. Reach, grab, clip. Reach, grab, clip. I continue until the basket is emptied. By now, my fingers are bone-chilling cold, simply brittle appendages attached to my hands. For a moment I question the sanity of hanging laundry outside on a November morning. Then I hurry inside the kitchen with my empty basket. Warmth envelopes me as I glance at the temperature monitor, which registers at 32.5 degrees, barely above freezing. 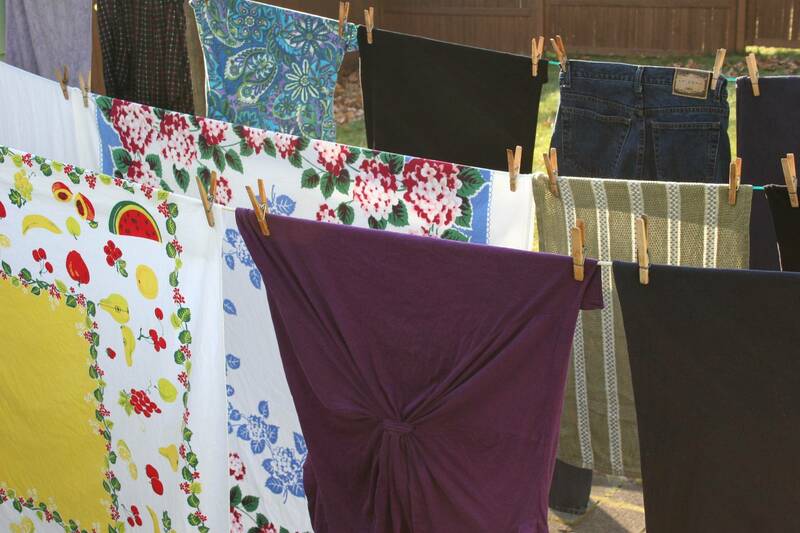 An hour later I am outdoors again, the feeling back in my fingers, pinching vintage tablecloths onto the line. 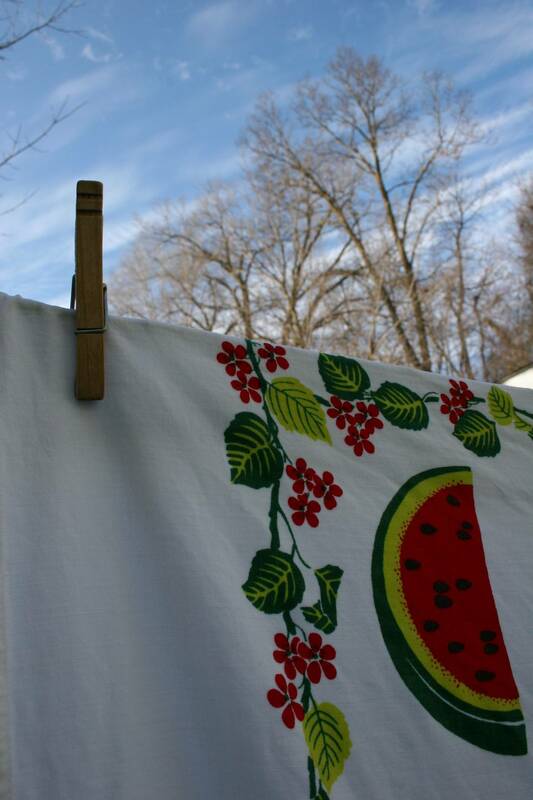 Watermelons and flowers on linen, reminders of summer hung out to dry on this brisk autumn morning. To the east, the brilliant sun radiates through the bare branches of the maple in my backyard. To the west, barren trees stand stark against a blue sky dashed with wisps of white clouds. Despite the cold that numbs my fingers, this is a beautiful November morning, perfect for hanging clothes on the clothesline. The bright sunshine aims through the bare maple at the wet laundry. 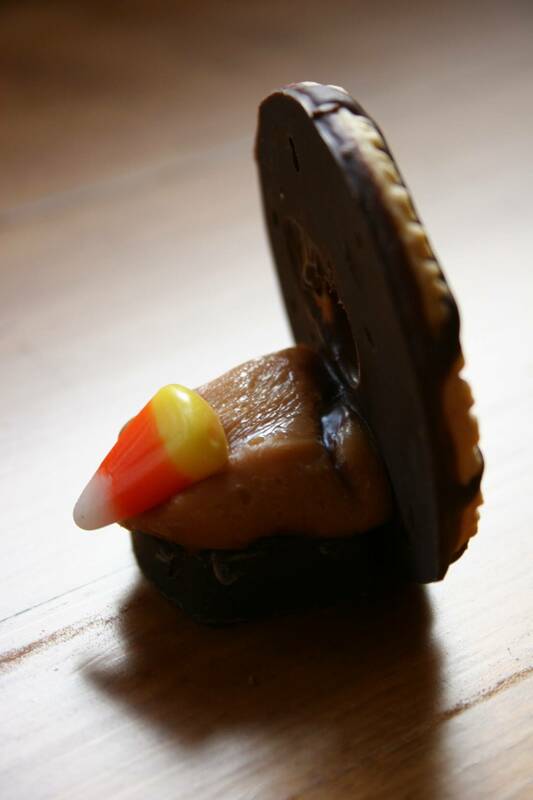 A candy corn, caramel, chocolate candy square and a fudge-striped (skunk) cookie are assembled to create a turkey cookie. “WHAT WOULD YOU like to bring for Thanksgiving dinner?” my sister Lanae asked in an e-mail just weeks before the holiday. She was helping her daughter organize the meal for extended family and we could choose from vegetables, salad, rolls, dessert, all the usual fare. Soon a second e-mail arrived. “You forgot the most important thing. Turkey cookies,” my oldest daughter, Amber, wrote. She then offered to make the treat. My mom, who had started the whole turkey cookie tradition, gladly relinquished the task to her granddaughter. “Good!” she declared upon hearing the news of Amber’s volunteerism. But only days before Thanksgiving, Amber was apparently regretting her impulsive decision. “…I’m not sure if I’m going to have time to make them….suddenly I have no time and I have to decide what dessert to make. So we’ll see,” she e-mailed me. “I expect there may be great disappointment if you don’t make turkey cookies, especially since you offered to make them,” I replied. I figured Amber was probably hoping I would rescue her. But I didn’t. She found time and showed up to Thanksgiving dinner with a pumpkin dessert and a cake pan full of turkey cookies. These aren’t just any old cookies and I understood exactly why my mom was so happy to give up turkey cookie making. And I understand exactly why Amber stated quite clearly that she doesn’t intend to make turkey cookies next year. 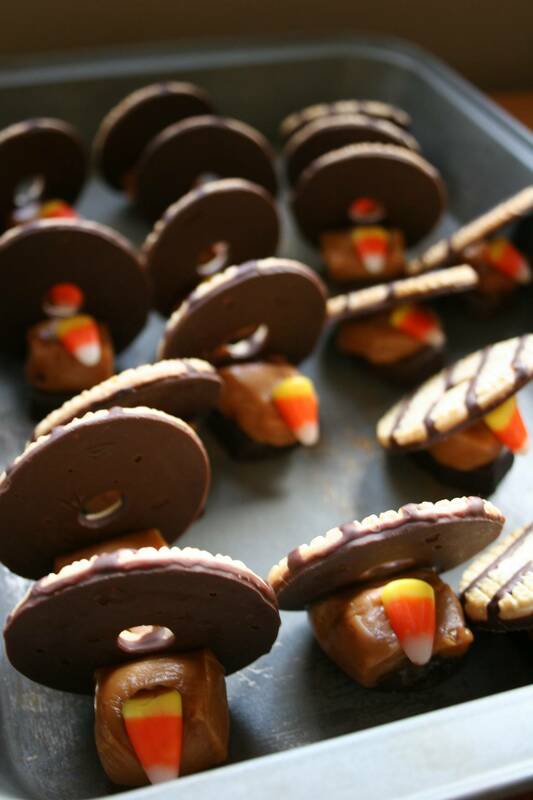 Assembling these turkeys from several candies and a store-bought skunk cookie requires time, patience and some skill. Well, you know those fudge-striped shortbread cookies, the ones with the hole in the middle that you can stick on your pinkie? Those would be skunk cookies. My Grandpa Bode always had those cookies in his cookie box, not cookie jar. And because the cookies are striped like a skunk, they became skunk cookies to me and my siblings. Now our kids call them skunk cookies. So do our cousins and aunts and uncles on my mom’s side. And so do others we’ve convinced to adopt this appropriate name. Turkey cookies made from skunk cookies. Sound delicious, don’t they? Amber made a whole flock of skunk turkeys for Thanksgiving. The cookies were attached backwards, my mom said, but then quickly added that she liked them better this way. I think she didn't want her comment misconstrued as her volunteering to make the cookies next year. IN THE SPIRIT of Thanksgiving, this week’s Minnesota Prairie Roots’ virtual Friday flowers focus on thankfulness. Those of you who have been following Friday flowers know that each week I “give” virtual flowers to individuals, businesses or organizations deserving of thanks, in need of encouragement or who are celebrating. 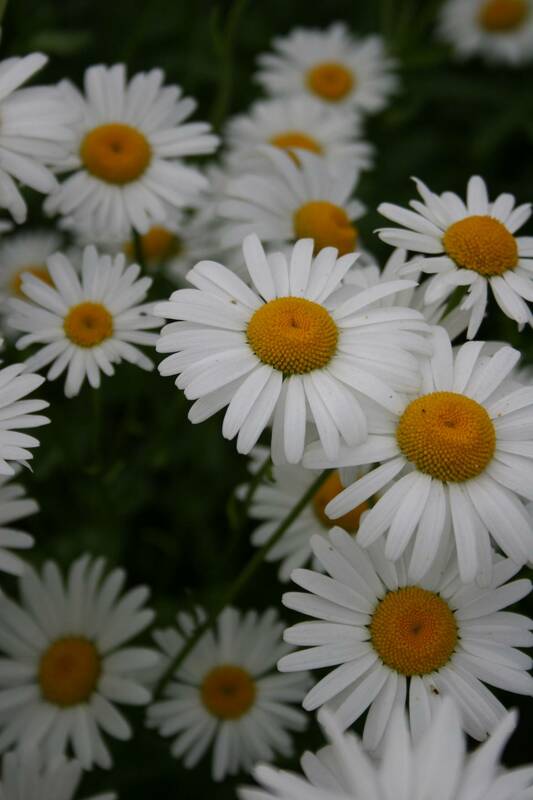 I photographed these daisies in my yard this summer. They are among my favorite flowers for their simplistic beauty. My niece, Tara, and her husband, Andy, who bought a house in Champlin several months ago and bravely volunteered to host Thanksgiving dinner for extended family. Twenty-one of us gathered for a scrumptious meal, laughter and togetherness. Thanks, Tara and Andy, for having us. Jerry and Mal Hlady, who spearheaded the 24th annual free community Thanksgiving dinner in Faribault. This year, more than 1,000 meals were served. Without the generous donations of local businesses and individuals and without the many volunteers who peel potatoes, debone turkeys, wash dishes, greet diners, deliver meals and more, this event would not happen. Thank you to everyone involved for giving to others on Thanksgiving. Keith, a friend whom I’ve known since childhood but haven’t seen in years. An email Keith sent today reminds me why he’s such a wonderful person. Keith shared that he is quite busy caring for his 88-year-old mom, Leona. He writes: “Mom is a GREAT old gal…I am committed to helping her live out her days the very best that she can.” What more could a mother ask for in a son? The readers of Minnesota Prairie Roots. Thanks for reading my posts and viewing the photos I publish on this blog. I am truly humbled and honored that so many of you have embraced my writing, my passion. My readership continues to steadily grow, and for that I am grateful. 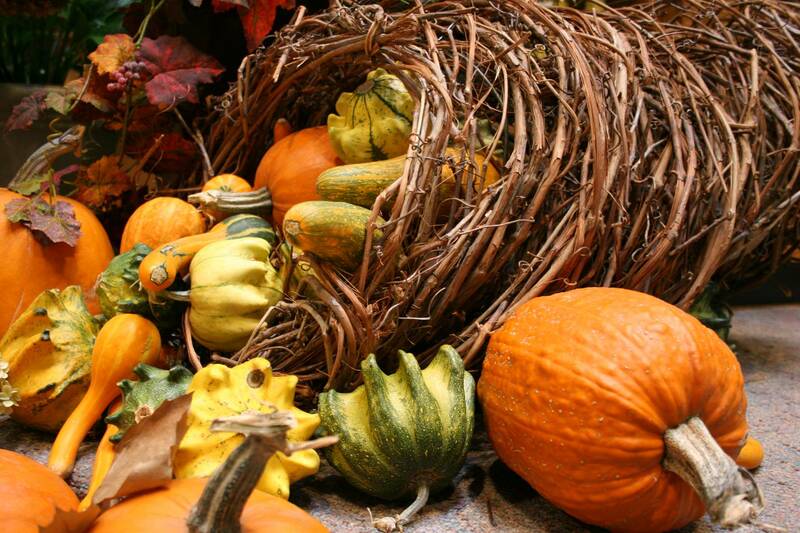 A Thanksgiving display at Trinity Lutheran Church in Faribault, Minnesota, celebrates the harvest. 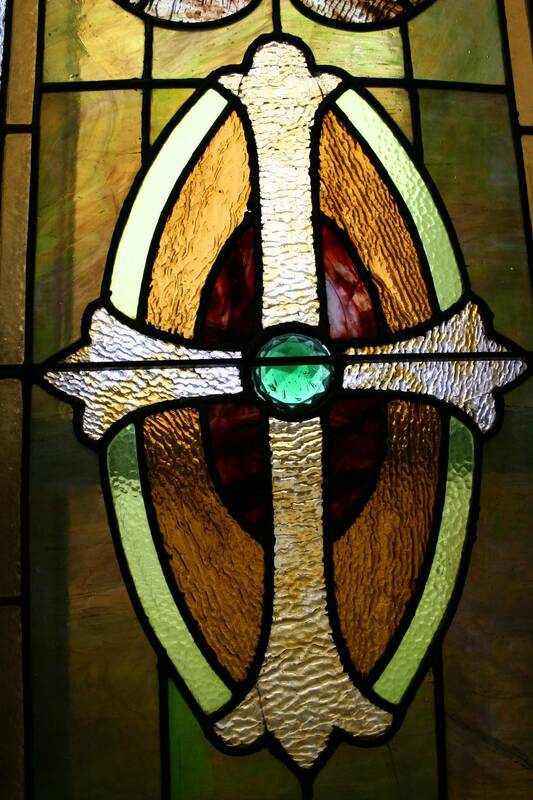 A cross incorporated into a stained glass window at Trinity Lutheran. THIS THANKSGIVING, take time to thank God for the many blessings in your life. 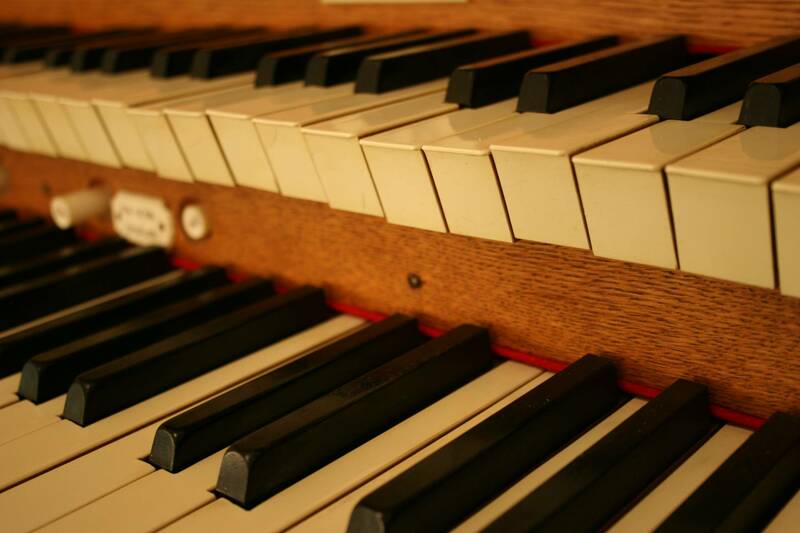 Keys on the 114-year-old organ at Immanuel Lutheran Church, rural Courtland, Minnesota. 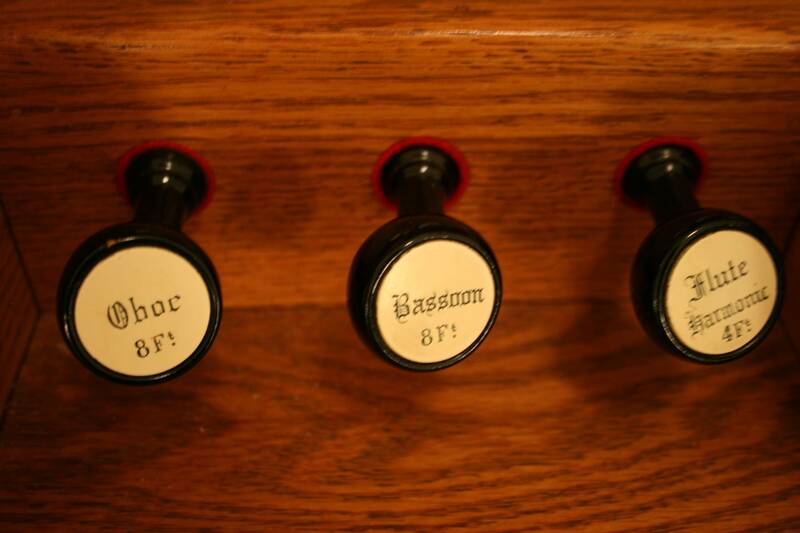 Pipes on the old Immanuel organ. And how do two bloggers, who attended high school together, write on the same topic on the exact same day? That would be me and blogger Beth Johanneck of Richfield. 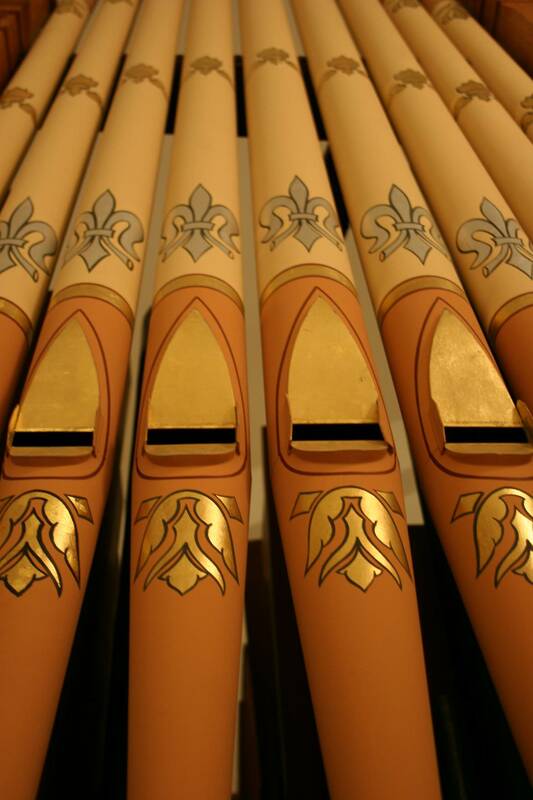 Last Wednesday, Beth wrote a post, “In Praise of Church Organists,” on her Minnesota Country Mouse blog. That’s her lead in the first paragraph. I posted “Singing praises at a Faribault hymn fest” on the same day. Now, what are the chances that, from all the topics we could choose, we would both write about organists on November 18? Beth was freaked. I wasn’t so much freaked as awed. Here’s the deal, and I think Beth would agree. Although we were Wabasso High School class of 1974 classmates and shared a locker, we never were close. Friends, yes. Just not friends as in a person you hung around with either during school or after classes. Following graduation, Beth and I never saw each other except at the occasional class reunion. But then, several years ago, we reconnected when I wrote a Minnesota Moments magazine article about her grandfather, Arnold Kramer, a folk artist pegged as “Minnesota’s Grandpa Moses.” See http://arnoldkramer.com. So I guess it should come as no surprise that sometimes we choose to write on the same subjects, like organists. I must add, though, that Beth grew up Catholic and I grew up Lutheran. Despite our lack of closeness as teenagers, I’ve grown to appreciate Beth for her honesty; her quirky sense of humor; her ability to truly “see” the world around her (and often from a unique perspective); her genuine interest in history, art and more; her creative gifts; her care for others; her appreciation of the simple things in life; and so much more. All of these qualities shine in writing that is distinct, humorous, introspective and down-to-earth. Read for yourself. I only regret that it took three decades for us to rekindle a friendship much deeper than the surface friendship of our teenage years. 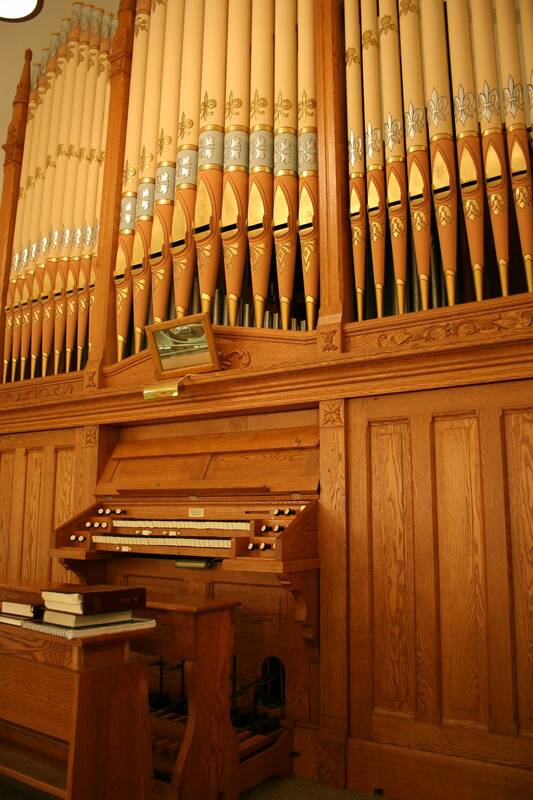 This majestic vintage pipe organ graces the balcony of Immanuel Lutheran, Courtland, the church home of my maternal ancestors. When the Hermann Monument was dedicated 112 years ago in New Ulm, August Schell Brewing Company celebrated the occasion with a special beer, Hermann's Brau. This year the brewery brought the beer back. 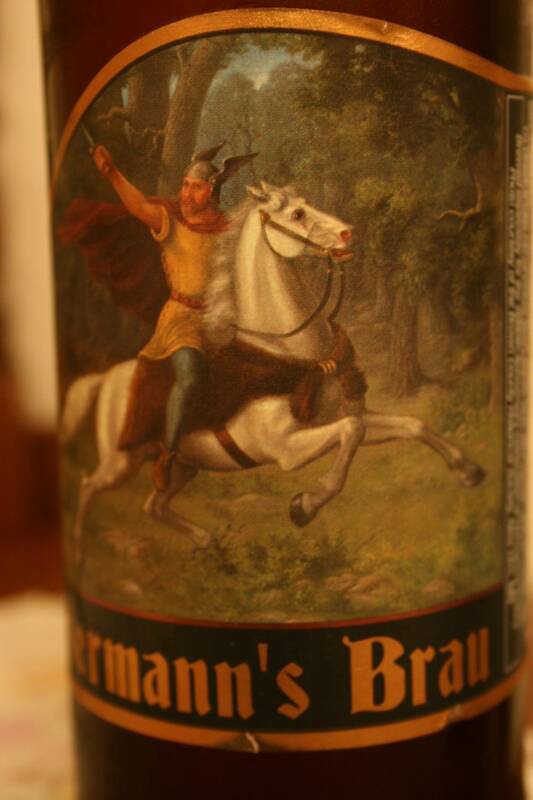 A close-up image of the beer label, Hermann the German charging into battle on his white horse. So, good German that I am, I had a beer Saturday evening. But not just any bier. I drank Hermann’s Brau, a limited-edition beer from Minnesota’s undeniably most German city, New Ulm. 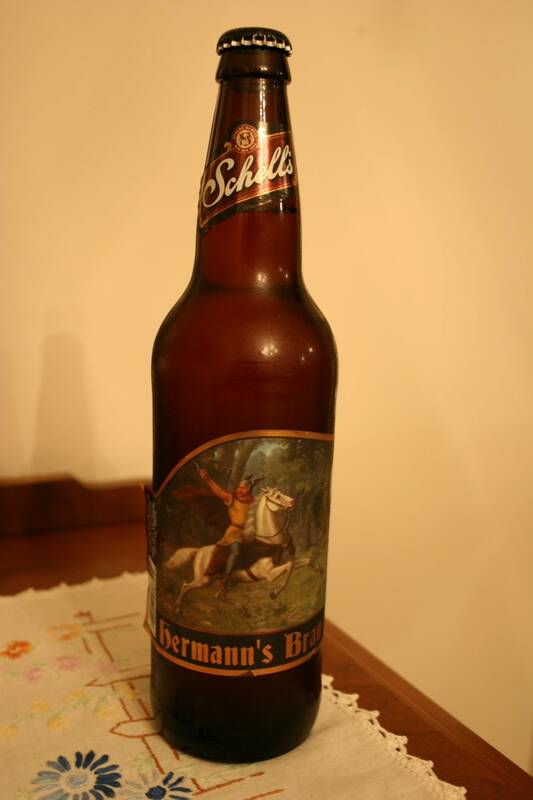 August Schell Brewing Company brewed Hermann’s Brau to commemorate the 2000th anniversary of the Battle of Teutoburg Forest in September. 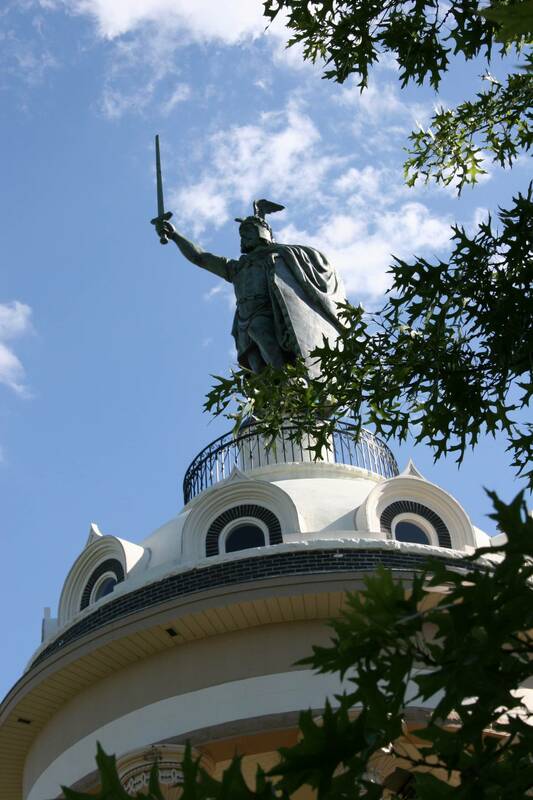 Hermann, a German warrior, led that battle and is honored in New Ulm with a towering statue atop a hill. Since that anniversary celebration, two bottles of this coveted beer have been chilling in my friend Lois’ refrigerator. Lois picked the brew up per my request, to “get me some of that beer when you’re in New Ulm.” But finding Hermann’s Brau took a bit of effort. Lois searched two locations before nabbing two bottles of the precious $3-per-bottle commodity. Schells produced only 200 cases of the beer. I’m uncertain how many bottles that equals because, well, these bottles hold 22 ounces of beer, enough to fill more than one stein. So, on Saturday night, Lois and I shared Hermann’s Brau with our husbands, the two Randys. We complimented our beer with a German meal of brats, potatoes, sauerkraut, pickled beets and warm applesauce. And even though I had not made German potato salad, Lois’ Randy tells me the pre-appetizer apple/potato/cheese/apple cider soup tastes a bit like German potato salad. It does. As for Hermann’s Brau, we conclude: “This is good.” We’re just occasional beer drinkers, not beer experts. A statue of Hermann the German towers above the trees in New Ulm. An 1840 Philadelphia Derringer, like the pistol used to assassinate President Abraham Lincoln. 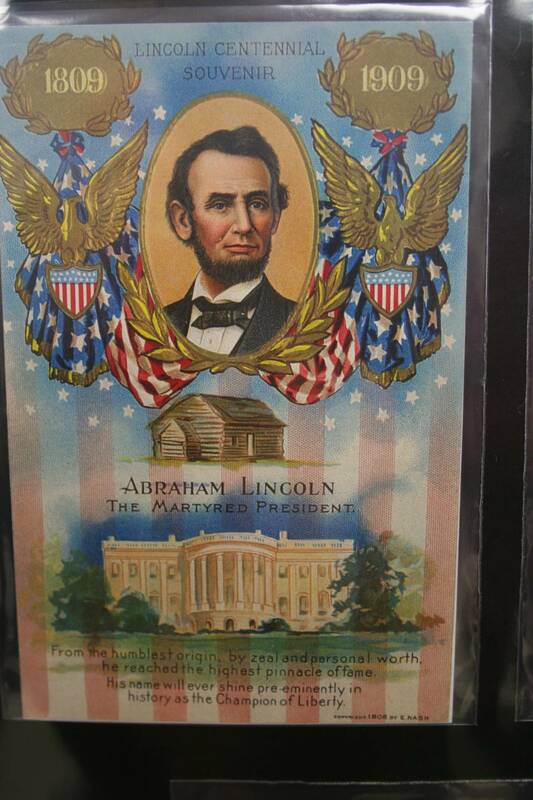 A 1909 postcard celebrates Abraham Lincoln's February 12, 1809, birth. THE PISTOL WEIGHS HEAVY in my hand. Cold metal and wood against warm flesh nestled in my palm. 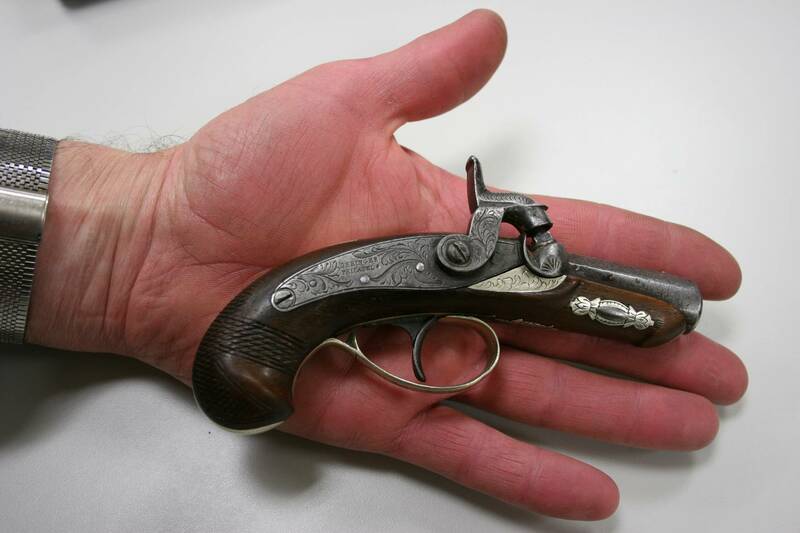 I am surprised, really, by the weight and smallness of this curved 1840 Philadelphia Derringer, which is exactly like the deadly weapon John Wilkes Booth fired at President Abraham Lincoln on April 14, 1865. I have not come here this Thursday night expecting to handle a Derringer. Instead, I expect to view original slave documents from the South during the November meeting of the Cannon Valley Civil War Roundtable in Faribault. I am a member of the interested public, not of the Roundtable. The evening’s presenter, however, left the slave documents at home. I am disappointed. But only momentarily. He brings instead a whole tote full of interesting Lincoln-related memorabilia. Roger—not his real name because he looks directly at me and requests anonymity—is a collector. Big-time. 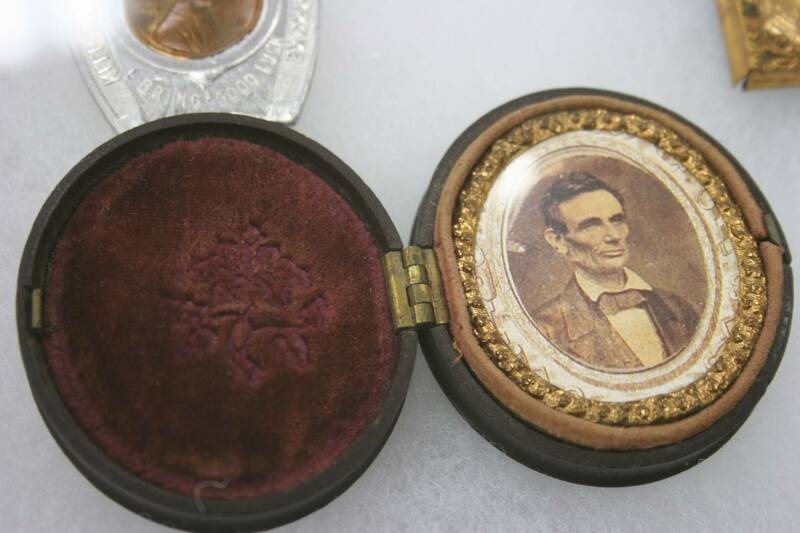 He collects guns, coins, autographs (like an original George Washington signature valued today at $35,000 – $40,000), stamps, photos, Civil War era postcards, Civil War uniform buttons and more. He’s been collecting for 25 years, not with the thought of getting rich from his collection, Roger says, but because he “likes it.” That passion is clear to me as Roger, who emphasizes he’s not a historian, rattles off historical information that I’ve long forgotten, or perhaps never learned. Lincoln, he claims, had a bone disease that would have killed him before his term ended. A month before his assassination, the President had recurring visions that someone would be killed. Roger shows off the 1840 Derringer, tells us that shot at a distance, this pistol only would sting like a BB gun. But at close range, the weapon proves deadly. Later, when I pick up the Derringer, I feel for the first time the weight of John Wilkes Booth’s terrible act, something I’ve never experienced by reading a history book. That sense of touching history pervades this evening. I imagine the soldiers who fought in the bloody battles of the Civil War as I admire uniform buttons secured in a case. I wonder about the people who sent the colorful vintage postcards now tucked inside protective plastic sleeves. I ponder Lincoln’s Presidency as I study the original photos of Lincoln in Roger’s collection. I consider the demons that tormented Mary Todd Lincoln as I photograph replica china that she insisted on for the White House. I am surprised at what I have learned in just two short hours. And I am surprised at the intensity, knowledge and devotion the dozen or so gathered here clearly possess regarding the Civil War. Among them is 11-year-old Brandon, a self-proclaimed “history freak.” The sixth grader has come here from Owatonna with his mom, who says she’s simply the chauffeur for a son obsessed with the Civil War. But she says that in a good way. Brandon’s interest in the Civil War traces back to his great, great, great grandfather, who served in the Union Army. Today Brandon role-plays in First Regiment Minnesota Volunteer Infantry re-enactments. He’s the fifer, still learning, he says, to play the small flute-like instrument. He’s been to Gettysburg and Harpers Ferry and helps teach sixth graders about the Civil War. Learning about “what the soldiers went through” draws him into Civil War history. He hopes to someday become a history teacher and a farmer. The future educator will practice his teaching skills when he talks about visiting Civil War battlefields at the February 18, 2010, Cannon Valley Civil War Roundtable meeting. I hope to be there, for I have much to learn. For more information about the CVCWR, contact Dan Peterson at (507) 332-8250. An original photo of Abraham Lincoln in Roger's collection. He also has prints of originals. 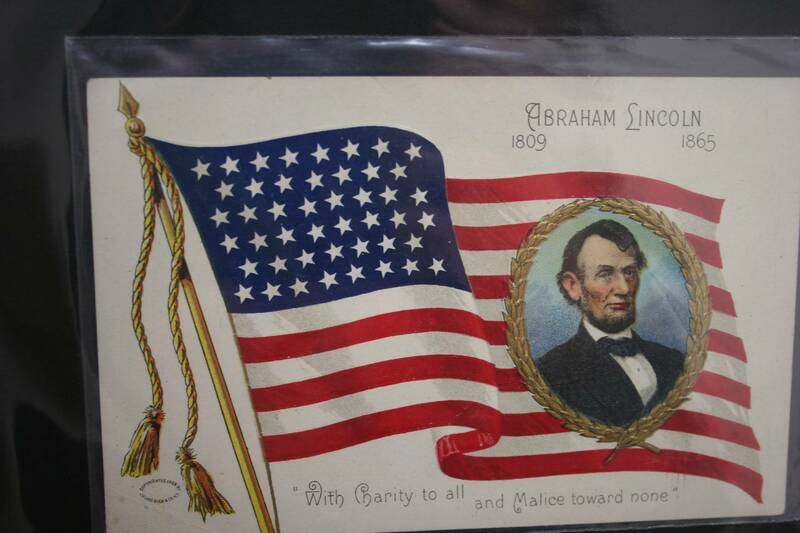 Another of Roger's postcards honoring Lincoln. 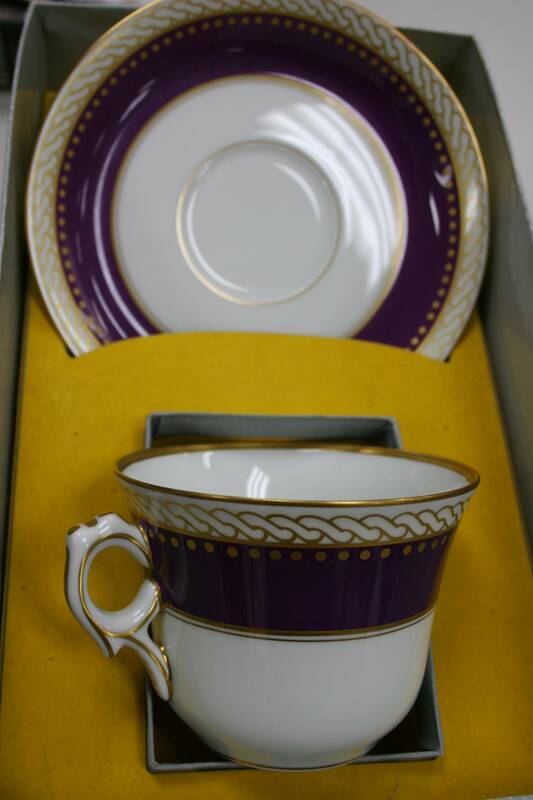 A replica of Mary Todd Lincoln's White House china. More Civil War uniform buttons and insignias.